I am delighted with the finished result which is very natural looking and very comfortable. There are various ways of treating these conditions such as the use of veneers and orthodontic appliances(braces) but what happens if you lose all of your teeth? 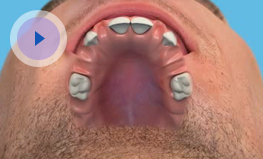 Historically the way of replacing partial to total tooth loss has been by providing the patient with dentures. Nowadays, dental implants are an option worthy of consideration and indeed at Dental fx we can provide a patient with an implant retained denture which has a number of advantages over a conventional denture. However, if you decide not to pursue dental implants, what types of dentures are available in today's dental practices? 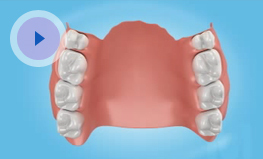 Dentures are naturally retained in the mouth by a combination of factors. If you have never worn a denture before, it can take some time to learn how to eat with artificial teeth and it requires skill and practice. Each person's mouth has a different structure, and this can affect the retention and stability of the denture but the secret is to persevere and after some time you will find it easier to adjust to having a denture in your mouth. If the denture feels slack, sometimes it can help to use a denture fixative which helps to hold in the denture and increases confidence in talking and eating. Many dental surgeries stock these fixatives or they can be bought over the counter at your local pharmacy. It is very important that dentures are cleaned on a daily basis and as much as possible removed at night to allow air to circulate round the palate. When cleaning dentures, half fill a basin with warm water and clean the dentures over the basin...having the water in the basin will minimise the risk of damage if they should be dropped. If you have dentures that are giving you problems or you would like to talk to a dentist about filling gaps in your mouth with a denture then please give us a call and we will be delighted to arrange for you to see one of our dental surgeons.